Would-be homebuyers — especially first-timers — had an uphill climb in 2015, with tight lending standards, high rents and down payment requirements keeping many on the sidelines. Unfortunately, experts say, it’s not going to get any easier next year. The complex U.S. housing market is continuing to recover from the severe downturn it saw during last decade’s recession, but it’s a spotty rebound that is forcing many Americans to devote more of their income to keeping a roof over their heads. Homes are appreciating in many markets, which is good news for developers, builders and homeowners in general. Nationally, home prices in October rose more than 5 percent on a year-over-year basis, according to the most-recent S&P/Case-Shiller National Home Price Index, released Tuesday. In hot spots like San Francisco, Denver and Portland, Oregon, prices were up almost 11 percent. But that’s a double-edged sword for people who own homes and are thinking about moving: Their homes may be worth more, but so are the ones they want to buy. As a result, many are staying put and creating a dearth of entry-level homes for first-time buyers, especially young adults. Meantime, prospective homebuyers are forced to devote more of their paychecks to rent. Real estate website Zillow calculates that rental prices have risen 52 percent since 2000, a period in which incomes for renters have only increased 25 percent. Increases in building permits and an easing of lending limits imposed after the recession created some optimism entering this year. 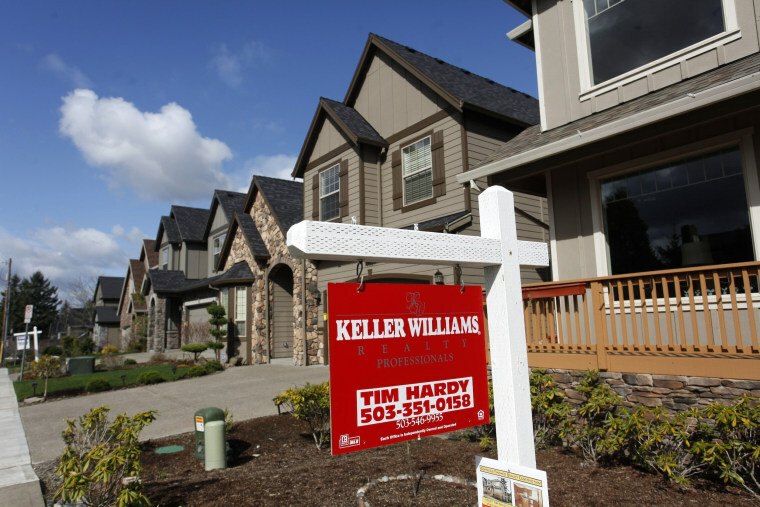 “We all thought 2015 was going to be the year of the first-time homebuyer,” said Zillow chief economist Svenja Gudell. But that didn’t happen and Gudell isn't optimistic that the housing logjam will break in 2016 either. Saving up for a down payment is the biggest stumbling block for first-time purchasers, said Trulia housing economist Ralph McLaughlin. “This younger generation, 25 to 34 years old, have overwhelmingly told us that, number one, saving up for a down payment is the most difficult thing to do for them to become homeowners,” he said. Young adults face some unique challenges, in that they’re more likely to be under-employed or work lower-paying jobs, and many of them have student loans that have to be paid off, which siphons away the amount of money they can sock away toward a down payment. The lingering effects of the recession on the housing market add to the difficulty, said Zillow’s Gudell. More than 13 percent of homeowners are underwater nationally, she said. In places hard-hit by the foreclosure crisis like Las Vegas, the number is closer to one in five. And entry-level homes are three times more likely to be underwater. Even homeowners who are technically no longer underwater still might not have enough equity in their home to making moving financially feasible. Today, just under 64 percent of Americans own their own homes, the lowest level since the late 1960s. That means demand for rentals, especially in places with thriving job markets, has skyrocketed. The median asking rent in the third quarter was $802, according to Census data, and that won’t even get you in the door in hot markets like San Francisco and New York. The rental arms race isn’t over either. A survey of more than 500 property managers conducted this fall by the website Rent.com found that just over two-thirds expect to raise rents next year, with an average 8 percent increase. The much-discussed Federal Reserve interest rate increase in December probably won’t have a major impact on the real estate market in the new year, although higher mortgage rates will exert a slight downward pull on buyers’ borrowing power, McLaughlin said. “We wouldn’t expect it to really change the overall trajectory of households buying a house but we do expect it will have an impact on how much they can borrow,” he said. Typically, higher borrowing costs act as a brake on home price appreciation, but with the supply of entry-level homes so tight, McLaughlin said the most would-be buyers can hope for is that prices will stay flat in 2016. The exception could be the country’s hottest markets, coastal cities like San Francisco, Seattle Los Angeles, Miami and New York, Gudell said. As the Fed raises rates, “They will feel that more than less-expensive housing markets. We’ll start to see those markets cool down just a bit,” she said. But don’t expect any fire sales. “These market are hot for a reason,” Gudell said, predicting the year-over-year price drop will amount to just 2 percent to 3 percent.